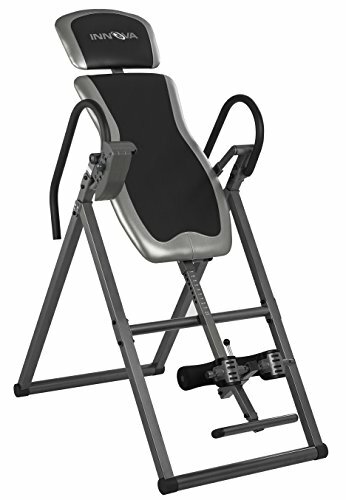 You are here: Home / Cardio / Best Inversion Table Reviews 2019 – Do NOT buy before reading this! Here is the best inversion tables list as reviewed by Fitensity’s team – let’s go for an inversion! This is a well-made, sturdy table at a very reasonable price. The Gravity 4000 was one of the first inversion tables we tested and it has set the bar high. 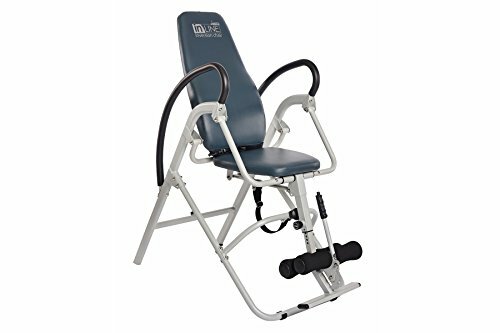 We can’t see anyone that would be left wanting for more if all you’re looking for is an Inversion table; this is a very good one indeed. Built from solid tubular steel, the 4000 comes with a very nice scratch-resistance powder coated finish. This gives it an above average load capacity of 350 pounds. Non-skid rubber floor pads prevent any sort of movement during use. Overall the table feels strong and stable. Speaking of handles, there’s a ‘palm activated’ adjusting ratchet for the ankle lock. This thing holds your ankles nicely and securely and there are also molded ankle cushions so that you don’t feel like you’re being held, hostage. There are several other nice touches that really showcase why this thing deserves our top spot. Adjustable tether straps make sure you don’t invert yourself past 180 degrees, which is definitely a good thing for most people. Another handy safety feature is the vinyl side covers that protect your hands and fingers. Speaking of nice touches, we really liked the inclusion of a removable lumbar pillow for those that would appreciate the extra lower back support (we do!). The table also folds for storage. There are no gimmicks, no ‘extra’ features. 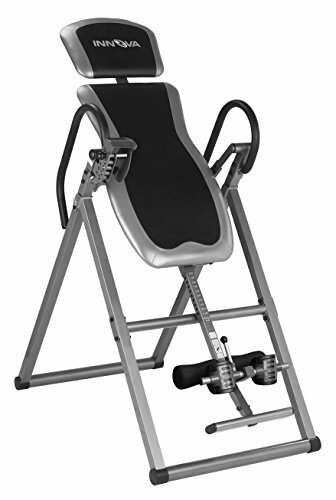 This is just a well-made, high-capacity inversion table that does its main job well enough to be at the top of our list. The 560 has the distinction of being the only inversion table to have received FDA approval for treatment of back pain, muscle tension/spasm, herniated disc, sciatica, spinal stenosis, facet syndrome etc. As such, it is a class 1 medical device. FDA certification Isn’t the only accolade that Teeter tables have racked up. They are also certified by UL (Underwriter Laboratories) after subjecting them to a host of durability, reliability and ease-of-use tests. I think you can probably tell by now that this is a serious piece of equipment. How does it compare to other tables? Well, it doesn’t. You see the EP-560 is the standard by which we judge other tables. It may seem a bit pricey but its utility is unmatched. There’s a lot going on here that makes this table worth more than the sum of its parts. The EP-560 is made with high-grade materials that offer a ton of durability and safety. Heavy-gauge steel parts and specialized pivot bearings are used for durability. Safety takes a prime spot on the list of priorities with features like auto-locking hinges, cam locks and a secure lock-out in full inversion. Comfort is especially important for people using inversion therapy to rehabilitate serious conditions. The EP-560 supports surround the ankles and help distribute user weight equally around the feet and heels. An ankle dial makes it possible to adjust foot height for smaller or larger feet. This table features additional support for the lower back and neck which also enables a deeper stretch should the user so desire. The table bed has strategically placed nodes that provide the variable intensity of pressure-point relief. The table bed provides a smooth-enough surface for the user to slide and optimize the level of stretch to relieve back pain for example. At the same time, the bed flexes to accommodate the body and the contours keep you comfortably in place. The adjustment tether has markings for 20, 40 and 60 degrees of inversion. Not only does this let you get to the desired angle in a snap, it also helps in an easy progression for the first-time user to full inversion. The table is perfectly balanced, allowing you to freely recline and relax once you’ve dialed in your height and locked your ankles. Arm movements can be used to shift body weight and easily control the level of rotation. A secure lockout upon full inversion gives you the confidence to push yourself with advanced exercises and challenging stretches. We’re not done yet. The Teeter was really easy to assemble. While some tables took us almost an hour to set up, the EP-560 was done in about 15 minutes. It also folds for storage and comes with some very handy instructional material. If you want the best, this is it. 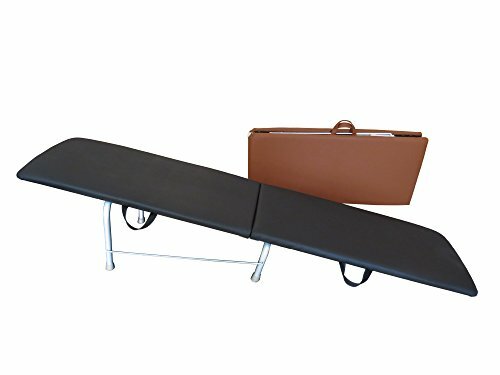 idea of a table you can carry with you? Maybe you just want something that won’t clash too much with the décor in your living room and doesn’t invite a thousand awkward questions from guests. 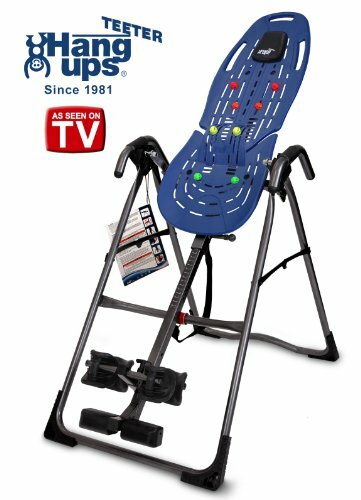 If we’re speaking your language, you should probably check out the Gravity Pal- The only truly portable inversion table (that we could get our hands on). What the Traveler is, is a low-angle inversion table. Or to put it another way, it’s a slanting table, also known as a slant board. Your grandma probably had one or knew someone who did. As the saying goes, old is gold and the Traveler is available in a rather attractive soft-gold. If that’s too flash, there’s also good old saddle brown. Either way, the Gravity Pal Traveler is absolutely beautiful. The low angle gently realigns your spine, improves circulation, eases pain and improves recovery. Only a couple of minutes are needed to feel the benefits. Made in the USA, this handcrafted piece of art doesn’t require any unsightly straps to hold you in place. Simply get on and off, this thing is nice, easy, gentle. Sticking with the ‘something different’ theme, here’s an inversion option if you prefer chairs to table. There are a couple of reasons why the Stamina Inline might appeal to you. The first one is practicality; if you’re looking for a chair and a way to invert yourself, why not get something that does both? This thing can fulfill the purpose of a chair for the majority of the time it won’t be used for inversion therapy. The second reason is that the inline chair is ideal for rehabilitation, suitable for all levels of fitness and flexibility and a particularly good choice for someone with limited mobility. The ease with which one may get on or off makes it one of the most comfortable and convenient choices when it comes to inversion equipment. Being a chair doesn’t mean it has to compromise on its therapeutic abilities though; this thing is just as capable as more traditional inversion tables. So, when you need it to do its thing, it will not disappoint. But the rest of the time, it’s a nice, comfy chair. What’s not to like? If you’re the kind of person that just wants the basics, aren’t interested in additional therapies like heat or acupressure that pricier tables offer and don’t want to spend a whole lot; the Innova ITX is for you. Don’t let the low price suggest that this thing isn’t capable. We’d go as far as to say that we’d consider giving it our top spot just for the value it offers. There’s just one caveat; you’d want to set aside at least an hour to set it up and we hope you have access to some quality tools because what comes in the package isn’t very good. If, however, you can get past the sometimes-tricky assembly process, this table will do the job just about as well as the others. This is a sturdy, heavy-duty table that offers a lot of bang for the buck. That’s our list. Consider giving inversion therapy a shot if you haven’t already; the benefits are real and the effects are felt in minutes. Everything on the list has been extensively vetted and they’re all great choices. Is Inversion Therapy Really Effective For Back Pain? The short answer is, yes. The long answer obviously has to take into account the actual cause of the pain, your specific condition as well as the overall physical state. Most often, back pain is caused due to excessive compression brought on due to spending long hours in a seated position. Humans weren’t really designed to sit in one place for 7-8 hours and so it’s not surprising that over time, the gap between the spinal segments reduces and eventually, back pain manifests. Inversion therapy works on a similar principle to the traction that may be applied by a chiropractor in order to straighten out and elongate the spine, only in this case your own body weight is being used to achieve the effect. Inversion therapy isn’t new, it’s been around for centuries. Yoga, for example, has several postures that lay an emphasis on inverted poses and they all achieve spinal decompression to some effect. Of course, this is subject to one putting in the time to learn yoga and is also determined by the individual’s level of flexibility and overall health. Inversion tables do all the work for you and will work their magic while you lie down and (try to) relax. One can consider purchasing a gym/fit ball for some intermediate assistance in stretching their back, which is a bit easier than stretching on your own and a whole lot cheaper than an inversion table. 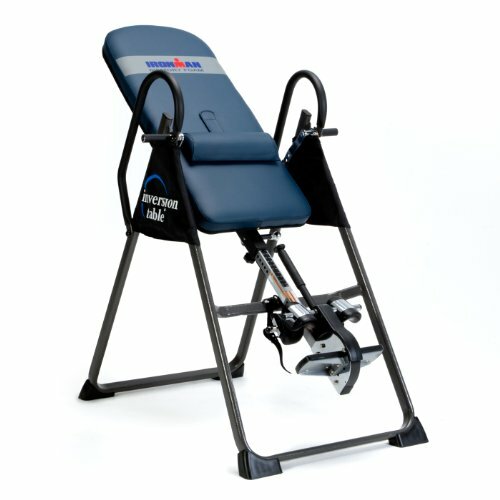 However, if you’re someone who has been dealing with back pain for a while, spend many hours in an uncomfortable seated position or are an athlete looking to try out anything that advances your recovery, consider investing in an inversion table; we’re confident it’ll be worthwhile. 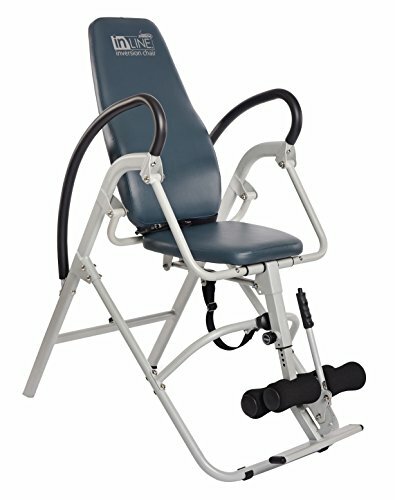 How Much Time Should One Spend On an Inversion Table? As long as you like. Most table manufacturers have their own ideas about the ideal amount of time you should spend on their contraptions. 3-10 minutes seems like a reasonable starting point for most people although we think your best bet is to listen to your body, check for any weird aches or pains and most importantly, have someone close by, especially when trying it for the first time. Every person is different. We recommend going at your own pace and slowly increasing your inversion time as well as angle. As with most physical interventions, it is much more beneficial to be consistent and spend a little time on it every day than spending a lot of time doing it once a week. We hope this review will help you to choose the best inversion table. Inversion therapy has a number of health benefits. If you’re reading this, you’re probably aware of most of them. Either that or you have a specific issue you want to tackle. Well we have reviewed some best inversion table and also don't forget to check out top pick's. 3 Is Inversion Therapy Really Effective For Back Pain? 4 How Much Time Should One Spend On an Inversion Table?